Okifolki turned four weeks old yesterday and I'm really getting into the swing of running a business. I must admit, it's been far busier than I ever expected for the first month. Things are warming up nicely! Today I cranked up the wood burner for the first time this winter and it's cosy and toasty here at the Bowmans' abode now. 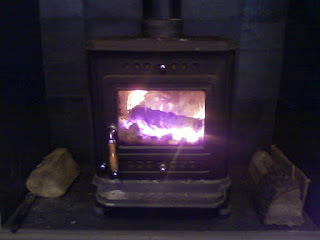 With advent starting tomorrow, the season's festivities are just around the corner and the heat is on!! I've been working on several designs that include mistletoe this year. Mistletoe is great for warding off bad spirits and encouraging fertility. Now don't be misled here; if you're not trying to expand your family, the term 'fertility' can also apply to that earthy fruitfulness that brings about prosperity in other areas of our lives, like our store cupboards and bank accounts. Mistletoe is also known as 'all-heal' and has been used for thousands of years as a medicinal cure, particularly for disorders that require a calming effect, such as high-blood pressure, arthritic pain and convulsive coughs. Do not attempt to use mistletoe to make your own herbal remedies unless you are an experienced herbalist as it can be poisonous. However, you're perfectly safe hanging some up to encourage life improvements of a material nature. If you buy in some live mistletoe right now, it may well be looking a little sad by the end of next month, and a withered, dried up old bunch of leaves isn't going to inspire much positivity, and I doubt some mass-produced plastic will evoke too much activity from the natural universe either. 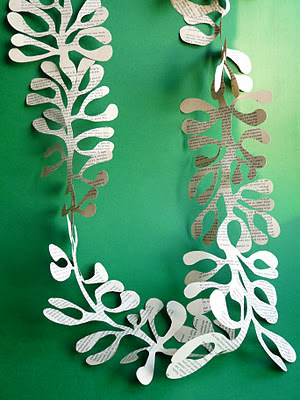 Recycled paper is kind to the earth and easy to use in creating symbolic mistletoe decorations. 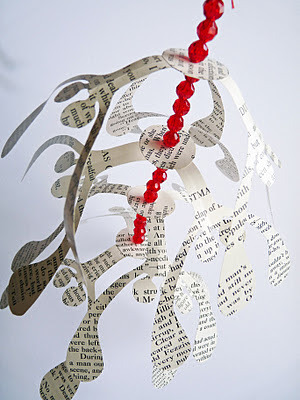 Cut some mistletoe shapes out of old newspapers and make a wreath, a garland or some other hanging decoration. Ward off those negative vibes and encourage healing and growth into your home this winter. And if you know anyone who's hoping for the patter of tiny feet, catch a kiss from them under your mistletoe. Even if it doesn't produce the desired offspring, it'll certainly spread the feeling of cheer and goodwill to all!